Jori’s work can be found elsewhere on the web, with some of her series posted at different archives. 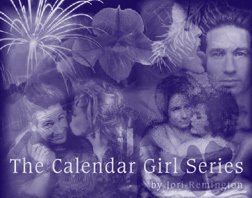 The Calendar Girl Series I & II, however, can only be found at Gossamer, but it’s difficult to work out the order, so we’ve recreated the original pages for the two series here. It’s important to note that CGII was never completed, so if you need closure on a story maybe just stick to the first series. The stories in this series cover the whole angst spectrum, sometimes with a carefree and playful Mulder and Scully but frequently delving into torture and angst. All but 2 stories are rated NC-17 so no kiddies allowed. Click on the image to go to Calendar Girl I.